So. . .if you're not sure what all this is about let me start by explaining. I'm participating in The 100 Day Project. 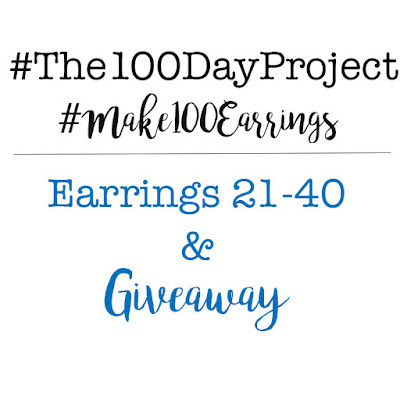 It's taking place on Instagram, using the hashtag #The100DayProject. The purpose of the project is to participate in creativity for 100 days. Each participant picks a project or activity to work on for the 100 days, chooses an original hashtag of their own, and shares what they've done each day for the 100 days (using both the project's hashtag and their own.) 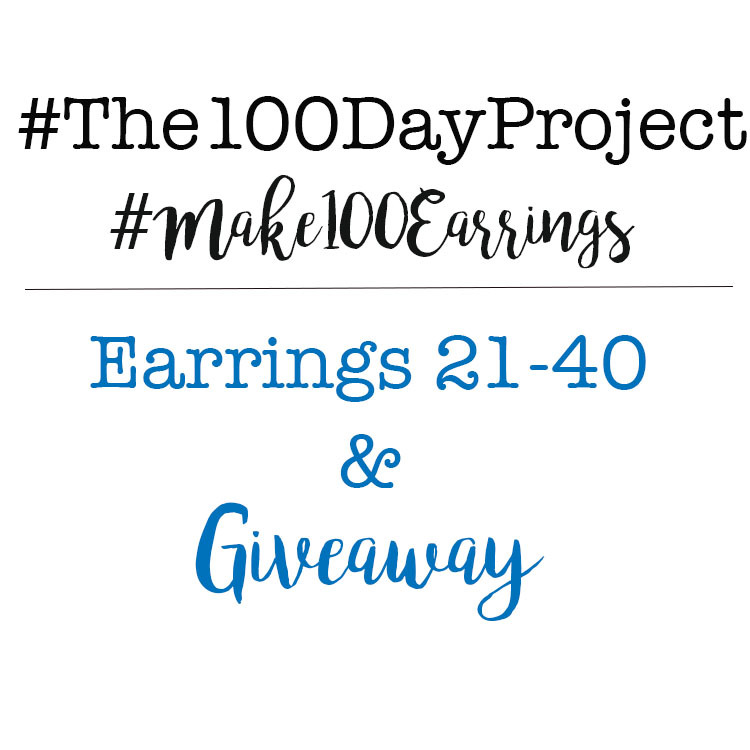 I've selected #Make100Earrings as my hashtag as I'm working on making a pair of earrings each day. So far, I've been able to keep up with the challenge. But, I don't want to jinx myself so I won't dwell on that too much. If you want to see the first twenty, check out that post. 21: I only vaguely remember making these. What I recall is the desperation of making them. I had worked on creating something else that just wasn't coming together before finally forcing myself to "just make some earrings already." So, these fell together. 22: It's entirely possible that the copper beads in these were the ones I struggled with the day before. I made myself take a different look at them and they became these using turquoise beads and large textured links from a ZnetShows.com chain. 23: After seeing a bunch of black-eye Susans on the side of the road, I was inspired to throw these golden floral earrings together. While they don't look like my inspiration, I think they're pretty fabulous. 24: These were made on such a busy day. Just before we headed out to dinner, I stacked these beads to go with my outfit and threw them in my ears. 26: These mis-matched pieces of tin were in a drawer of other bits I had made. However, I thought they matched just enough to become a pair of earrings. A few beads and lengths of chain finish them. 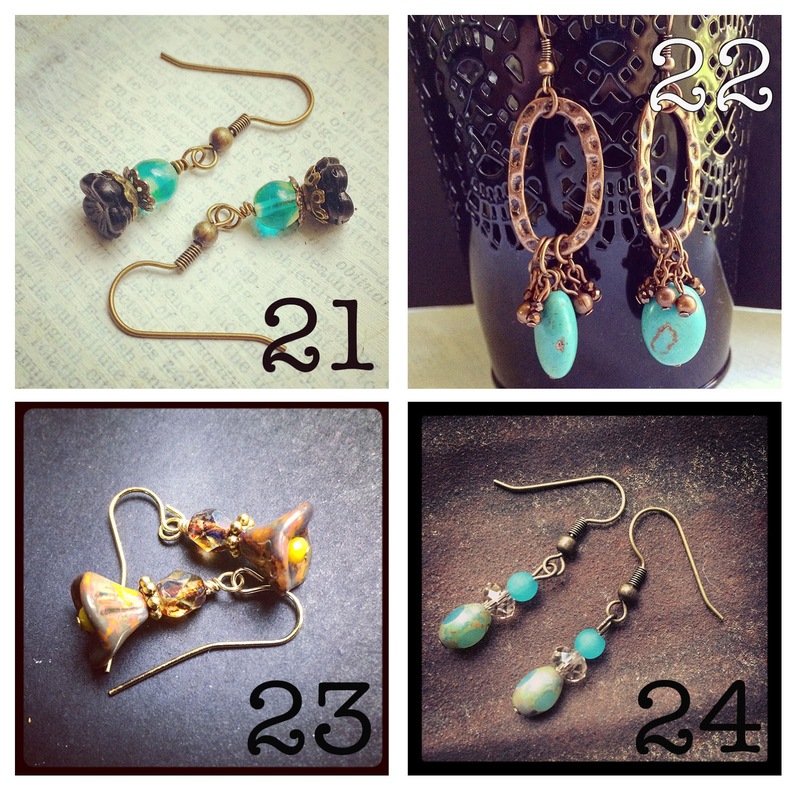 27: The large shank buttons in these earrings were the pieces that had stumped me a few days prior. Digging through the craft room, I discovered a couple sets of beads I had sorted for earrings. This set looked perfect to pair with the button. 28: I was in the mood to play. Iced Enamels were coated on the bottom of a few small bezels before rhinestone accents and resin were added. I hung these simply from Znetshows.com Chinese crystals and a few rhinestone spacers on an eye pin. 29: Something called me to the red drawer of my bead cabinet where these large plastic beads spoke to me. The butterflies are Tim Holtz rub-ons that I sealed with mod podge matte. A few black beads finish them. 30. Since I created pink and red earrings on the previous days, I decided to make orange earrings. All the components came from my prepped box and simply fell together. 31: I let the fact that it was Star Wars Day inspire me and made a pair of lightsabers from green bugle beads and a few antiqued silver tone beads. They were fun. 32: Before realizing it was Star Wars Day the day before, I had started these yellow earrings to continue my ROY G BIV pattern. It didn't take much to finish this pair. Yellow is always a challenge in jewelry-making for some reason, so I was proud to have these made. 33: Green was the next color in the pattern. These long plastic beads screamed out to be used. A few gold tone beads dangle from the bottom to complete the pair. 34: I was called to my stash of altered blanks. These have a yellow-tone to them, thus making them slightly hard to work with. The addition of a couple of neutral white beads made it easier. 35: Turning to blue as the next color on the spectrum to tackle, I discovered these pretty little floral beads. They were stacked with bead caps, spacers, and a pair of black beads already on my desk. Done! 36: Wanting to make something a little more. . . mixed media, I fished out these washers that were altered with maps and sealed with ice resin. Large links of chain and a few bone beads complete the unique pair. 37: Desperate to really play, I used Iced Enamels again. This time I used raspberry, chartreuse, and turquoise on a couple of small keys. I think they are way fun and bright!! 38: I was away from home when I made these and dipped into the prepped box again. The ceramic beads have touches of indigo on them, working back into my rainbow pattern. I added the gold tone rings thinking that I would add bead dangles from it, but the rings look simply divine just as they are. 39: I had not an ounce of inspiration in me when I finally got to making these. So, I went for my favorite colors: purple and blue. The little star charms added a little something extra. 40: My inspiration returned with a vengeance. I snipped these from tin, filed and sanded, hole-punched, and aged them. Taking the blue from the tin, I added bead dangles. I LOVE these! 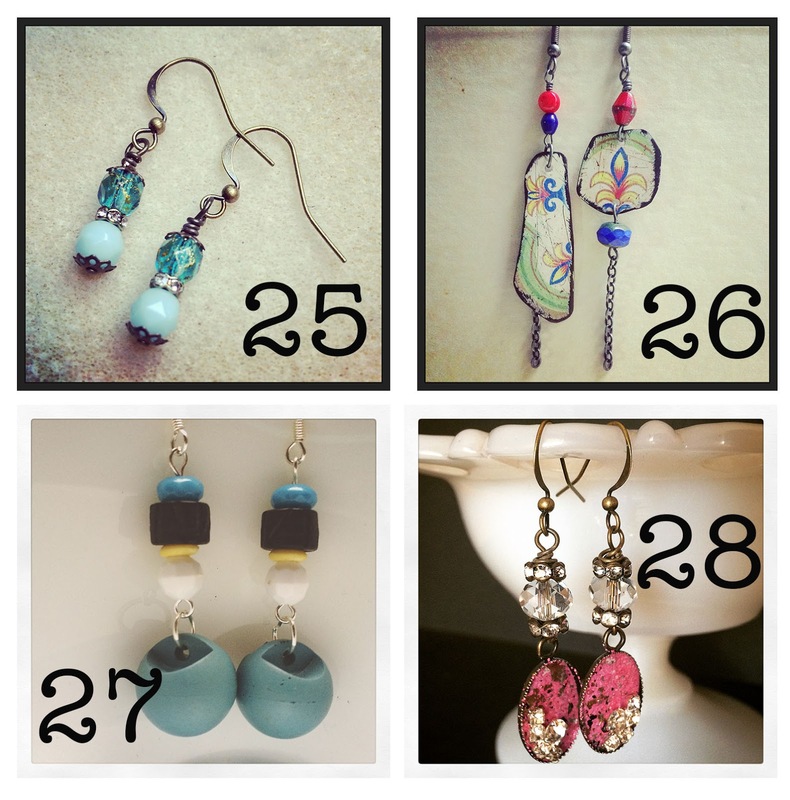 So, that's been the last 20 days of earring-making. There are some stunners and some so-so pairs. In all, I think this set is better than the first twenty. Speaking of the first 20 earrings. . . I promised a giveaway. There were 14 entries. The Winner is Clare from ClaresCoffeeTime!! Alas, Clare...I don't have your e-mail as requested. So, PLEASE get with me this week so I can send you your prize. If I don't hear from you, I will draw another number. Now. 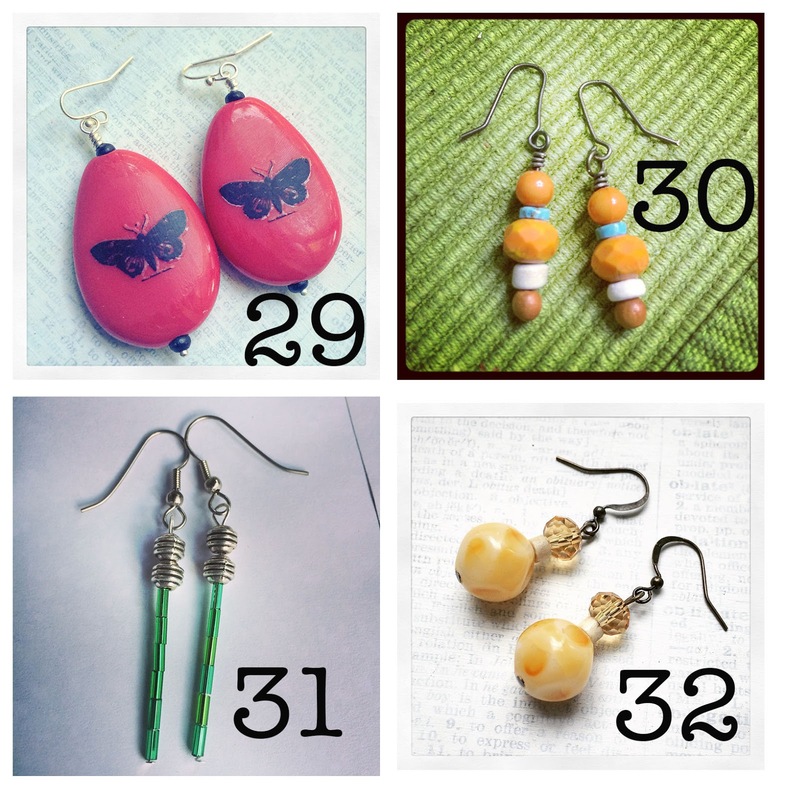 . . as mentioned above, I'm having another giveaway for some of these earrings. Once again, this will only be open to US residents. Let me know what your favorites are in this group of 21-40. Please pick two or more and leave me your e-mail address. I just want to know what people like. I appreciate you taking the time to take a peek!! The deadline will be Friday, June 2nd. I will announce the winner on the 3rd. I like #22 and #28. They are all very pretty. Pamela, Thanks so much! I have to admit that I like the majority of this batch so much better than the first ones! You're entered. Good Luck! You are such an amazing designer! I love all of them, each and every one... but #'s 22, 23, 28, 35, and 36 are calling my name! Thank you for another amazing giveaway! Angi, Thank you. You are too sweet. I'm so pleased you like so many of them. Thanks and good luck! Another great set of earrings that makes it difficult to choose favorites! Numbers 40,36 and 26 really jump out at me as unique and creative. 38, 35, 28, and 27 are also very nice. Ha! Thank you. I'm much more smitten with these than the first sets. I think the making-every-day thing is paying off. Yay! Congratulations, Clare! Enjoy your earrings!! I'm going to enter before the last minute this time, Hope! My two picks this time are, #22 and #28. I just love these!! I also like #36, #39, & #40. My email: lhamilton114 at gmail dot com. Lisa, Ha!! You still got in last time. :) Thanks for playing along again!! I love 23. They are pretty, short, and elegant. 36 fascinates me. I love how you covered washers with maps. Very clever! 40 is another favorite. The tin is colorful and attractive. I am amazed that you are making and blogging all of these beauties. Very time consuming, but I am loving it. I am all about earrings! Another lovely batch of earrings! 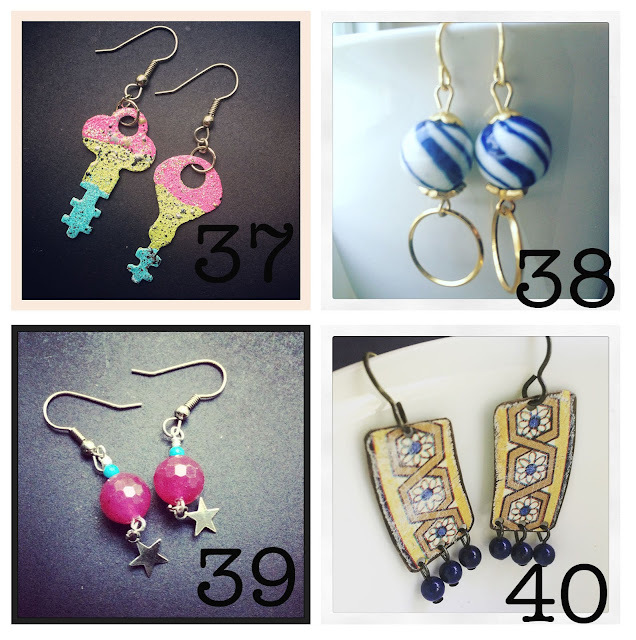 My favorites are #28, 36 & 40! Even though I can't participate in the giveaway draw, I just had to tell you that the mismatched and the tin earrings are fabulous! Thanks for stopping by my blog - I can see why you've fallen behind on the Wanderlust classes as you're in the midst of an earring making tsunami! They are all lovely. I especially admire both pairs of tin earrings. So I am picking again ~ 23, 26, and 40 are my absolute favorites out of this next round of 20 pair of earrings, but I will narrow it down to 23 and 40. Fingers crossed!!! Keep tinning Hope ~ they are awesome!!! 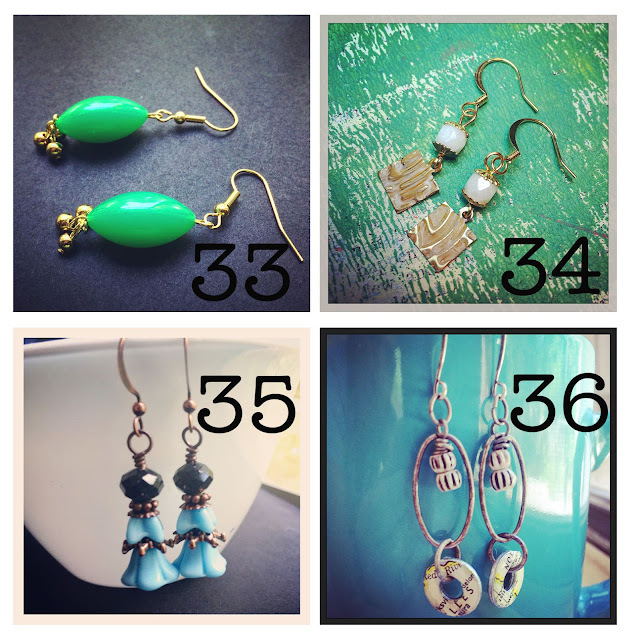 Just like the last batch, there are so many pretty earrings this time too! I really love #2.